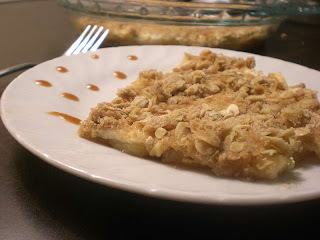 What I love about fruity dishes is that they can served as snack,breakfast,dessert.The apple cheese crisp I made is one such.In some cooksites you can see that crisps/crumbles come under dessert as well as breakfast category.I believe whatever time you serve,it should be tasty and healthy. Crisp or crumble as it is also known is usually baked fruits topped with a crispy crust.I had made plum crumble before and similarly apple crisp/crumble ,but in the conventional oven.I got hold of a microwave apple crisp with a cream cheese filling and found that what took almost 50 minutes in the normal oven,took only 10 minutes in the microwave.If you can make it under 10 minutes and has fruits and grains then surely you can make it for breakfast :D.
In a microwave safe dish,mix together apple layer ingredients.Mix thoroughly and if possible spread them in a layer and microwave them from 3-5 minutes till they start to get cooked.In a small bowl,mix together the cheese and sugar until creamy.Add other ingredients for the cheese layer and mix well.Spoon the cheese mix over the apple layer and spread it evenly. 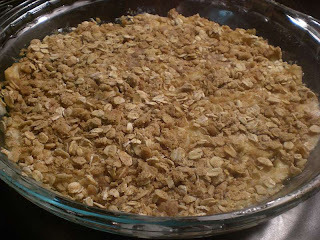 In another bowl,mix together oats,flour,cinnamon and brownsugar.Cut small pieces of cold butter into this and mix well till the mix resemble coarse sand grains.Sprinkle the oats-flour mix over the cheese layer. Microwave the crisp uncovered,on high for 2-3 minutes until the apples are completely tender and the cheese and top layers are cooked well. If you are using more apples,the timings may change.Always start with 2 minutes and keep on adding 30 seconds if needed. Cut into wedges and serve as a dessert with icecream or as a grainy breakfast drizzled with homemade caramel sauce.. This easy crisp also goes to Pavani where she is currently hosting MEC: Cheese an event originally started by Fellow Runner: Srivalli. I'm sure this will taste lovely...yummy recipe! looks delicious. give me bite please. Thank you, I sent the loaf to MM now. Seriously, where do u get such ideas? Smart and neat. looks yummy.....neat idea to do that in MW. Looking delicious apple cheesr crisp. I love fruity anything & this looks specially good! YUM! !